Keith is the bestselling author of three books on how to supercharge your performance and reach the top of the corporate world. Corner Office Rules: The 10 Realities of Executive Life (Kandelle Enterprises), opens the door to the often hidden world of the C-suite. 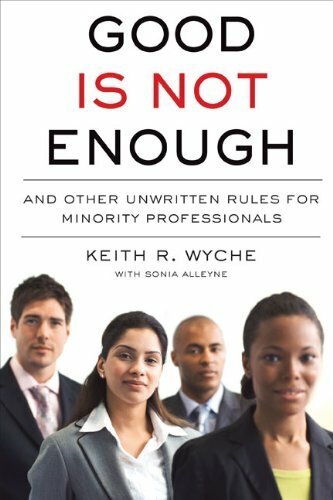 Keith’s first book, Good Is Not Enough: And Other Unwritten Rules for Minority Professionals (Portfolio, a division of Penguin Random House), was an Amazon bestseller and was nominated for the 2009 NAACP Image Award for Outstanding Literary Work. His newest book, Swag Is Not Enough: Career Advice for the Serious Millennial, was co-authored with his daughter Alana. In recent decades, corporate America has gotten better at recruiting minority talent. But despite their education and hard work, too many African Americans, Latinos, and Asian Americans still find unique obstacles on the path to senior management. And there are too few minority mentors available to help them understand and overcome these challenges. Keith Wyche, a division president at a Fortune 500 company, is the perfect mentor for ambitious minority businesspeople at all levels. His book, Good is Not Enough, is filled with thought-provoking insights and practical advice based on his own experiences and those of the many people he has counseled. Corner Office Rules is essential reading for anyone who thinks they’ve got what it takes to rise to the top of the corporate ladder. Through an engaging series of real-life stories told by today’s top professionals, readers will learn the tools they need to work their way from middle level management to that always envied executive leadership position. Welcome to the world of senior leadership! As you negotiate the often treacherous territory of corporate responsibility, Corner Office Rules provides the guidance you need to become the kind of leader you expect. The reality is that millennials possess some of the most innovative, and creative minds in the workplace. Unlike previous generations who adhered to militaristic hierarchies, groupthink, and chose to "live to work", millennials have decided that organizational layers create unproductive barriers, that groupthink stifles creativity, and that living to work leads to burnout. The problem is most of today's leaders are from another time and place. Until you are running the organization, you MUST learn how to work with, through, and beside them. Swag is Not Enough serves to enhance your ability to succeed by exploring common myths and perceptions regarding millennials. As a millennial, you will see yourself through the eyes of others, to better understand and ultimately overcome these misperceptions. Additionally, it will force you to look at yourself in the mirror to uncover some of your "blind-spots" and opportunities for personal and professional growth. Written by a millennial with editorial insights by her Baby-boomer father, the hope is that after reading Swag Is Not Enough, you will be armed with insights and lessons to take your career to new heights. Copyright © 2018 Keith Wyche. All rights reserved.